When it comes to self massage, tennis balls have officially met their match! The medium Knot Finder is a vast improvement to any ball on the market, AND it will never go flat. 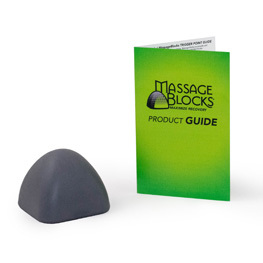 Massage Blocks provide a stable platform to drive consistent pressure into a knot. When using a ball, the ball moves and you move, making it more difficult to work a trigger point. With our tools, the point of pressure remains static, allowing you to direct and redirect targeted pressure specifically where you want the tool. It is easy to drive 30% of your body weight into a trigger point for as long as you like. Massage Blocks are a real game changer when it comes to managing minor strains and muscle tension.